Novation have brought their control surface expertise to bear on Ableton Live. The result is the Launchpad: a cheap, colourful and pleasingly idiosyncratic way to get hands‑on with Live. Novation's new Launchpad controller represents the first fruit of a new partnership with German software developers Ableton. This isn't the first time Ableton have joined forces with a hardware manufacturer to produce a dedicated controller. Reviewed in the September 2009 issue of SOS, the Akai APC40 offers a comprehensive assortment of buttons knobs and faders, all pre‑configured for easy integration with Live. A column of eight round buttons stands at the right‑hand edge of the grid, and another row of eight sits along the top. All of the buttons are made from a thick, translucent, rubbery material that feels very durable. The buttons are a fairly snug fit in their housings and have a slightly 'sticky' feel when pressed, almost as if there was a 'notch' half‑way down. This may improve as the unit is worn in, and will probably be less noticeable for more assertive button‑pushers. That's it for the top panel — and that's very nearly it for the rest of the device. Apart from a single USB socket on the right‑hand edge, the unit has no other switches, sockets or connectors. The Launchpad is 'host‑powered', drawing its current via USB. Overall, the Launchpad gives the impression of being an unusually solid and seamless slab of hardware. Four large rubber feet on its underside prevent it from sliding around, adding to the reassuring feeling of solidity. Using Live with the Launchpad: the red rectangle denotes the Clips and Scenes on which the controller is focused. If you're not already a Live user, a cut‑down 'Launchpad Edition' of the software is supplied (see the 'Going Live' box above for details on how this differs from the full version). Also on the same disc are device drivers for Windows and Mac OS. The quoted minimum system requirements are a G4 or faster Mac (Intel CPU recommended) with 512MB RAM (1GB recommended) and OS 10.4 or later, or a 1.5GHz PC with the same amount of memory and Windows XP or Vista. In both cases, a DVD‑ROM drive is also required for installation. Multiple Launchpads can be connected and used simultaneously. 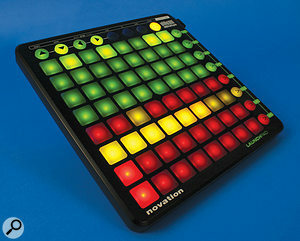 At the time of writing, the Novation web site says that 'up to three' Launchpads can be used simultaneously, while the Ableton web site suggests 'up to six' can. Unfortunately, I wasn't able to test either claim. In any case, a powered USB hub (or hubs) will probably be required to power multiple units, and you should expect each additional controller to add to the drain on system resources by a small amount. 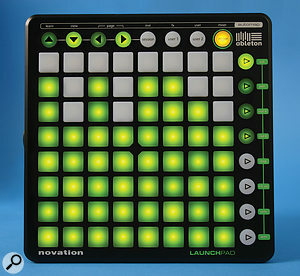 Installation of the Launchpad is not quite plug‑and‑play; Novation's confusingly‑named 'USB Audio Drivers' (the Launchpad has no audio capabilities) must be installed before the device is connected. The manual recommends then installing Live (assuming you don't already have it installed), before finally plugging your Launchpad in. Once Live is up and running, it's a simple matter of selecting the Launchpad as a controller in the 'MIDI Sync' tab of Live's Preferences. 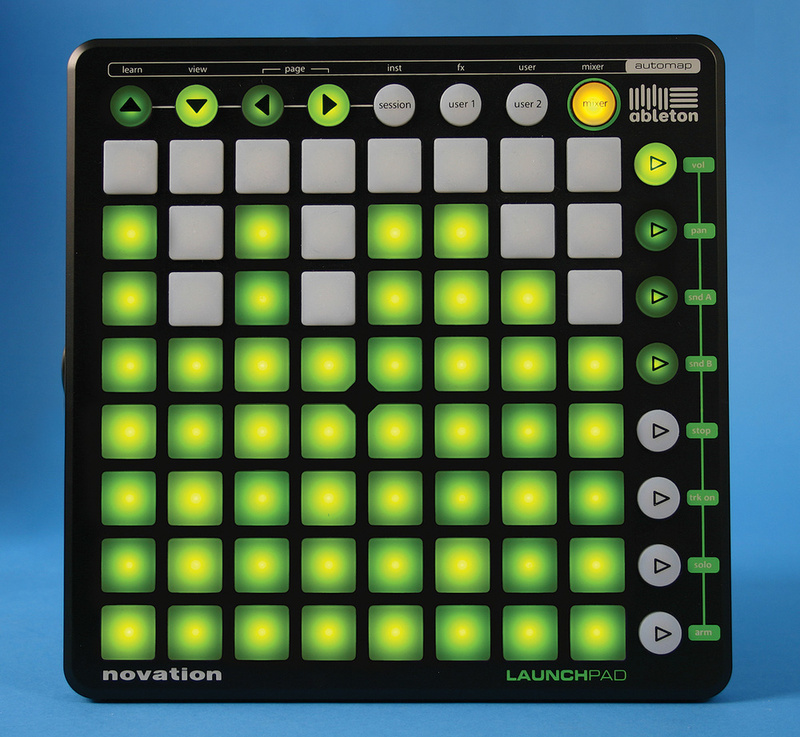 Live Launchpad Edition is supplied with a fair‑sized library of sample‑instrument content. This is welcome, but be warned (I'm warning you, Live won't) that installing this content is a long and slow process. Although the installation of the Live application itself takes no more than five minutes, when first run the program sets about installing its library to your user profile folder. This procedure lasted approximately two hours on my computer, with the hard drive thrashing all the while. Surely there's a better way of managing this? A brief (four-page) 'Getting Started' leaflet is included, and duplicated on the installation disc in PDF format. This covers the basics of getting the hardware and software installed and working. While it does contain useful information, this is perhaps a bit too brief. The Launchpad in Mixer mode. Each vertical column represents a channel fader. The Launchpad's 64‑button grid is multi‑functional, and operates in one of four modes. These are Session Mode (in which the buttons correspond with on‑screen controls in Live's Session View), Mixer Mode (in which they control Live's Mixer), and User 1 and User 2 (for making custom control assignments). The unit is switched between modes using the rightmost four round buttons at the top of the main grid. In Session Mode, the Launchpad effectively becomes Live's Session View, with each of the square buttons assigned to a Clip slot (in Live parlance, a 'Clip' is a section of audio or MIDI, often, but not necessarily, looped). The appearance of the Launchpad buttons reflects the status of the corresponding Clip slots: buttons assigned to empty slots are not illuminated; slots with Clips loaded have amber buttons; green buttons show which Clips are playing; and a red button means a Clip is recording. The right‑hand column of round buttons is used to launch 'Scenes'. (In Live, a 'Scene' is a row of Clip slots in the Session View, used to store and recall groups of Clips across multiple tracks). Of course, a Live 'Set' doesn't have to be hugely elaborate to use more than the eight Scenes or 64 Clip slots that Launchpad has buttons for (although the Launchpad Edition of Live is actually limited to eight scenes — again, see the 'Going Live' box). Consequently, when the Launchpad is selected as a control surface a red frame is superimposed on Live's Session View, indicating the 64 slots currently assigned to the Launchpad buttons. The four leftmost round buttons at the top of the main grid are marked with arrow symbols. Each push of these shifts the red frame up, down, left or right by one slot, updating the Launchpad's button assignments accordingly. Mixer Mode is more complicated. When the unit first enters Mixer Mode, the buttons display what's called (perhaps a bit misleadingly) a mixer 'overview'. The bottom three rows are used to arm, solo or mute the associated tracks in the Session View, while the top four rows display the volume, panning and send 'status' for each track. If a track's volume is set to unity gain (0db), the corresponding button in the top row glows dim green; if it's set to any other value the button glows bright green. Pushing the button automatically resets the track to unity gain. Similarly, if a track is panned dead centre, the button in the second row glows dim green; if it's panned left or right the button glows bright green. Pushing the button resets the panning to the centre. The buttons for sends 'A' and 'B' work the same way (with the default reset value being '‑inf', i.e off). In Mixer Mode, the top four round buttons in the right‑hand column access four further sub‑modes. The topmost 'vol' button tells the Launchpad to display an illuminated bar-chart display of volume levels in the Session View. Pressing a button causes the bar in that column to jump to the corresponding level, with the volume in the relevant track being adjusted accordingly. The buttons correspond with evenly spaced increments along the fader's travel, with unity gain at the second‑from‑top row. The 'pan' button switches the Launchpad to a very similar bar-chart display for pan values. Here, the middle two rows are used to represent 'centre', with the top and bottom rows being hard right and hard left respectively. The remaining two sub‑modes are for sends A and B, each of which has its own bar chart. Communication between Live and the Launchpad is two‑way, so that changing mixer settings on‑screen with the mouse causes the Launchpad's buttons to update accordingly. The Launchpad's remaining two 'User' modes provide two banks of freely‑assignable buttons. Exactly how you go about assigning them will depend on the environment you're working in. They can be assigned to any parameter in Live via the usual 'MIDI learn' method. Novation's Automap software (see the 'Automap' box) allows still more flexibility. Fundamentally, the Launchpad functions as a standard MIDI CC controller, and can be used as such by anyone willing to do the necessary setup and tweaking. The user modes come with preset assignments (which can of course be overwritten). 'User 1' has its buttons pre‑assigned to the virtual pads in Live's Drum Rack device. 'User 2' has preset assignments for Ableton and Cycling '74's forthcoming 'Max For Live' software package (see www.ableton.com/maxforlive). All this talk of modes and illuminated buttons may seem a bit confusing, and although the Launchpad is not difficult to use, it did take me a little while to get used to its layout and design. Session Mode is easy enough to grasp if you're already a Live user and familiar with Session View. The system of different‑coloured illuminated buttons is straightforward and provides an easy way to see what's going in a Live set — or at least in the first 64 Clip slots of a Live set. Shifting the Launchpad's red frame around the Session View allows control over more complex sets — although I have to say that in practice I found this slightly disconcerting. It may seem trivial, but the Launchpad's grid of buttons is square, while the eight‑by‑eight frame visible in the session view is rectangular, and significantly wider than it is tall. Although all the information is displayed correctly, this difference in layout can be a bit jarring, and to begin with I found myself hitting buttons in the wrong track columns as a consequence. To be fair, this improved once I'd been using the unit for a while; it seems to help if you can train yourself to ignore the computer screen as much as possible and concentrate on the Launchpad's buttons instead. The Launchpad's buttons are comfortable and respond best to a firm push, and the unit feels robust enough to withstand the kind of enthusiastic, stabbing fingers it will be likely to encounter during live performances. The buttons are neither pressure nor velocity sensitive, however, so although they can be used to trigger loops and one‑shot sounds, they're not really a substitute for the pads on a dedicated drum or percussion controller. In Mixer Mode, the buttons serve a slightly different purpose. Visually they're very effective: the illuminated 'bar charts' make the relative levels of the different parameters clear at a glance, even in total darkness. That said, as controls for mixing they have some limitations. Push‑button incremental parameter changes are no problem, of course. However, although it is possible to perform continuous pans and fades by dragging a finger along a row or column of buttons, I personally found it a bit knobbly and uncomfortable to do. Some more conventional mixer‑style controls would have suited me better (although I'm sure there will be Launchpad users who feel differently). When displaying pan parameters, the Launchpad uses the middle two rows of buttons as 'centre'. In practice, this means that there are only three increments of panning available in either direction and, although this is perfectly usable, some users might prefer to have finer‑grained control over it. I also encountered one or two minor (and not straightforwardly repeatable) bugs in Mixer Mode. Occasionally, when I changed volume, pan or send levels, stray buttons would either remain illuminated when they should have gone out, or would fail to illuminate when they should have lit up. These glitches were infrequent and purely visual; the Launchpad and Live were always in agreement about the real parameter values. Nevertheless, it did compromise the clarity of the visual feedback which ought to be one of the Launchpad's greatest strengths. Still, this is an early version of the device; hopefully, future driver updates will iron out any remaining quirks. Away from Live, the Launchpad may find other advocates. However, it's probably not such a good choice as a general-purpose MIDI controller (hardly a criticism, since it wasn't designed to be one). I'd imagine that most users of DAWs other than Live would like to have some mixer‑style controls in addition to buttons, and there are plenty of other controllers in this price bracket that can provide them — Novation's own Nocturn, for example. The option to use multiple units together presents some interesting possibilities, especially given the relatively low price. The Launchpad is designed first and foremost as a controller for Ableton Live, and does that job well. If you already have Live up and running, you can install the Launchpad in a couple of minutes and begin working with it almost immediately. The Mixer mode is useful, although I confess I found it harder to adapt to. (I'm sure there will be other Live users who take to it like ducks to water, however.) Once you get used to it, the Launchpad's grid of illuminated buttons serves a good, tactile interface for Live's Session View, and encourages the kind of improvisation with patterns and arrangements that has always been the program's forte. Akai's APC40 is the only other dedicated controller for Ableton Live currently on the market: it costs more, but has knobs and faders too. In design terms, the Monome controller (reviewed SOS September 2008) implements a very similar idea but has none of the preset integration of the APC40 or the Launchpad. The Launchpad Edition of Live is functional, and certainly serves as a good introduction to the program for anyone who hasn't used it before. Nevertheless, there are some significant differences between the Launchpad Edition and the full retail version of Live. Perhaps the most notable of these is track count: Launchpad Edition is limited to eight MIDI and eight audio tracks, while unlimited tracks are available in the full version. The same is true of Session View scenes. Effects are likewise limited to eight in the Launchpad edition, and signal routing in the mixer is less flexible. More details are available on the Ableton web site (www.ableton.com/pages/2009/novation_launchpad_vs_live8). In short, if you're intending to spend a lot of time working with Live, you'll probably want to upgrade to a full version sooner or later. Ableton offer an upgrade path, allowing Launchpad Edition users to upgrade to Live 8 for £249.99$329 (the full retail price is £349.99$449). Automap is a system Novation have been developing as a companion to their controllers for some time now. Originally no more than a set of pre‑made templates for popular plug‑ins and applications, stored in the controller's onboard memory, it has since evolved into something a lot more ambitious. Now, the Automap 'Server' runs in the background on your computer, and aims to pick up the parameters of any VST, AU, RTAS or TDM plug‑in (more precisely, any plug‑in that supports automation by the host application), hosted in any DAW. A generic 'MIDI client' enables Automap to communicate with other MIDI‑capable software, or with external MIDI hardware. Although the Automap software was not included on the Launchpad installation disc I received, Novation are keen to stress that Launchpad is compatible with Automap. The software can be downloaded for free from the Novation web site — although Automap Pro, which has more features, costs £19.99$29.99. The system is quite simple to use in principle. The Automap software has a 'plug‑in manger' in which you can locate plug‑ins installed on your system and alert Automap to their presence. Automap then 'wraps' them with its own control layer (wrapped plug‑ins typically appear in the host application with 'Automap' in brackets after their name), after which your Launchpad (or other Novation controller) should have immediate access to its parameters. In addition to controlling plug‑in parameters, Automap also offers a degree of control over built‑in parameters in host applications (mixer controls, for example). An in‑depth assessment of Automap is beyond the scope of this review. However, it's an elegant design, and in the course of my limited testing it seemed to work well. Novation's goal of creating a 'universal' control solution is admirable — although it's a pretty daunting challenge, given all the possible combinations of host applications and plug‑ins. However, this seems like an impressive attempt to solve the problem. Well built, with a clean and simple design. Multiple devices can (apparently) be used. Buttons slightly 'sticky' (at least when new). A good, competitively‑priced companion for Ableton Live. Potentially useful for other button‑intensive applications, although not quite so user‑friendly away from Live. Intel laptop with 1.5GHz processor, 2GB RAM and Windows Vista.